Rotary’s overarching focus on Peace and Conflict Prevention and Resolution is offered through 6 Rotary Peace Centres in 7 universities as Masters programs and Professional Certificate programs. 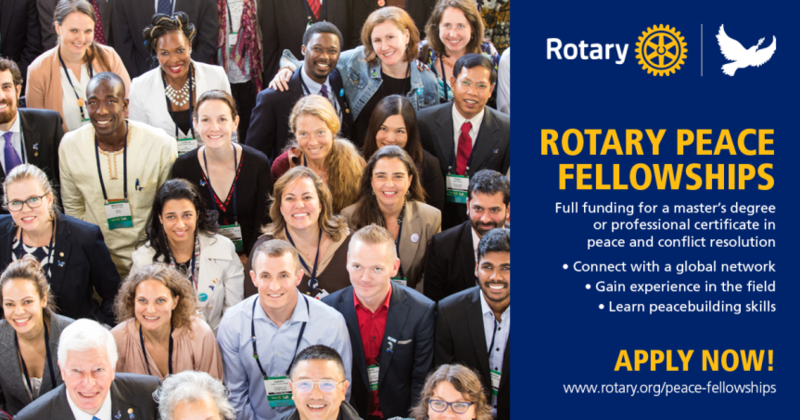 The Rotary Foundation offers up to 100 fellowships to eligible candidates every year and our dollars are well spent on these programs as investments in our future. 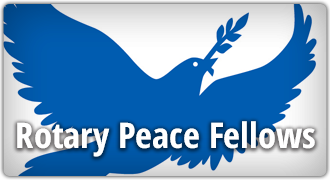 There are now more than 1,100 Rotary Peace Fellows working in over 100 countries as peace builders and change agents. Listening to the Rotary Peace Fellows share what they are currently doing at the recent RI Presidential Conference on Environmental Sustainability and Peace was an inspiration, reminding us of the amazing Rotary Peace Fellowship opportunities available. Potential candidates can apply through your club well in advance so that you can screen them for qualifications and eligibility. Any candidate acceptable to your club will then have to submit their application online by May 31st to our District 5040 for endorsement.